On Nov. 12, the European Space Agency's Rosetta spacecraft and Philae lander made history. The lander successfully made it to the surface of Comet 67P/Churyumov-Gerasimenko. Scientists confirmed the landing at a little bit after 11 a.m. EST (1600 GMT). See the latest landing photos! Mission managers working with Philae are hopeful that the lander will wake up again at some point as Comet 67P/C-G orbits the sun. The Rosetta orbiter captured Philae bouncing around on Comet 67P/C-G's surface just after its first touchdown last week. See the amazing images here. The Philae lander has fallen silent after its historic comet landing on Nov. 12. Scientists are still hoping that the probe will wake up again once the sunlight conditions near the lander change as the comet goes around the sun. Scientists are hoping that Philae's battery is still functioning on the comet as the probe drills into the surface of the icy body for the first time. Officials are also considering moving the probe to get it into a position with more sunlight. The European Space Agency's epic comet landing by the Philae probe and its Rosetta orbiter is an epic feat of human achievement. But it came perilously close to failure when a vital anchor harpoon system failed. See how it beat the odds with luck and design. An in-depth look at how ESA's Philae probe landed on its comet, despite the failure of anchor harpoons designed to make it happen. Scientists now say the Philae lander bounced twice before finally settling down on the surface of Comet 67P/C-G. Here's what we know so far on the historic comet landing. So Europe has landed a spacecraft on a comet. Now what? See what's in store for ESA's Philae lander and Rosetta orbiter at Comet 67P/C-G. 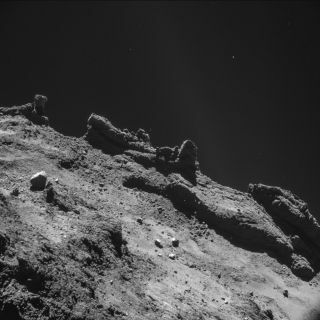 It wasn't a smooth comet landing at all for Europe's Philae lander. Early analysis suggests the probe actually bounced before landing on Comet 67P/C-G. The Philae lander is doing well as it makes its "seven hours of terror" descent to the surface of Comet 67P/C-G, ESA scientists say. And we're off! ESA's Philae lander has detached from its Rosetta mothership and begun the long, seven-hour trip down to the surface of Comet 67P/C-G. The nail-biting begins. Comet Landing - What's NASA's Role? ESA's Rosetta spacecraft is just hours away from attempting a daring space first: landing a probe on an icy comet. See the latest status report here. European scientists have created a strange "song" of the Comet 67P/C-G based on data from the Rosetta spacecraft. Listen to the weird song here. Here's when and where to watch the Rosetta spacecraft land on its target comet, and how to see live telescope views of the comet via Slooh.com. When Rosetta's Philae lander detaches from its mothership, the European Space Agency will have an agonizing seven-hour wait to see if the comet landing will succeed. Landing day is almost here for Europe's Rosetta spacecraft. See how the European Space Agency is gearing up for an epic comet landing. The European Space Agency is about to attempt something never done before: landing a probe on a comet safely. Here's how the Rosetta mission will make history. Even comets have a dark side. See the latest amazing photos of Comet 67P/C-G as seen by the European Space Agency's Rosetta spacecraft. Why go to a comet? Find out the answer and more in this rundown of the historic Rosetta comet landing mission. The Rosetta mission's "Site J" landing site has a new name. See the history behind the landing site's name "Agilkia here. The comet target of Europe's Rosetta spacecraft would emit an epic stink … if you could smell it. After 10 years and 4 billion miles Europe's Rosetta spacecraft has arrived in orbit around a comet, making space exploration history.